1. The city-wide crime rate (for crimes tracked by Crimestat) for the first 3 months of this year (January – March) is unchanged compared to the same period in 2011. 2. The overall crime rate in March of 2012 is 4% higher than in March of 2011. 3. Commercial robberies are up 42% for March (31% year to date). 4. Muggings are up 66% for March (39% year to date). 5. Shootings, (although the numbers are still small 18 total so far in 2012) are increasing at an alarming rate compared to 2011 (260%). In the February report I drew attention to the 3% rise in auto theft rate. In March the auto theft rate increased by 25% compared to March of 2011. This has all the appearances of an upward trend that requires immediate attention. If the Winnipeg Police Service allows this trend to continue unchecked it has the potential to negatively affect Winnipeg’s overall auto theft rate and undoing all of the awarding winning results achieved by the auto theft suppression strategy. 1. City wide crime (for crimes tracked by Crimestat) for the first 2 months of the year is down 3%. 2. The month of February however saw a 4% increase in crime. 3. Auto theft was up 3% in February. 4. Residential break-ins are down but commercial break-in are rising. 5. Robberies are on the increase (commercial robberies up 250% in February). 6. Dramatic percentage increase in the number of shootings although the actual numbers are still small. Caution: The rise (though modest) in the number of auto thefts is a concern. After years of declines this is the first reversal I recall. Steps should be taken to address this. Annual reports can be very useful tools, generally providing a review of the previous year’s performance. Like most major corporations, the Winnipeg Police Service releases an annual report. Based on the late year release of the 2009 Annual Report – it wasn’t made available until December 2010 – one can anticipate that it may be another 11 months before the public and media see the 2010 Annual Report. Eleven months after the fact is a little too late to get crime statistics. After 11 months, statistics, especially crime statistics, are old, stale and really of little if any use if one wants to analyze them and effect any meaningful change. So if you want a statistical preview of the 2010 annual report visit the Crimestat website and click on ‘view report’. Unlike the Annual Report (i.e. the official ‘picture book’ version), the website has no glossy pictures of helicopters and guns (the preoccupation of the mayor and current police executive). You can look at the pictures, however, when the actual annual report comes out in December. If, of course, that’s what you’re after. The ‘star’ again this year driving the majority of the 8% reduction in the crimes tracked by Crimestat was the award winning Winnipeg Auto Theft Reduction Strategy, the evidence based and data driven strategy that was implemented in 2005. If the outcome is known in advance don’t fool yourself into thinking you are doing research. When police agencies are considering the deployment of new technology, new tools or innovative service delivery approaches, it’s not good enough to cite their use in other jurisdictions as justification to replicate them. Unfortunately, all too often that is what happens. Mayors and police chiefs look at what other jurisdictions are doing and fall into the ‘cookie cutter trap’, an approach that assumes that if something works in another jurisdiction it will work here as well. A review of reports from the jurisdictions that are doing what you might like to do or emulate is substituted for real research. The conclusions and anecdotal accounts contained in those reports are treated as evidence. The fact is, what works in one jurisdiction may not work elsewhere. Consider the use of bait cars to address auto theft. Some cities that use bait cars claim they are the answer to curbing the auto theft problem. This may be true if the cars being stolen in a particular jurisdiction are high-end vehicles destined for export. When the strategy was tried in Winnipeg, it was largely based on recommendations from police agencies in other jurisdictions and the company selling the technology. Following the expenditure of a significant amount of cash it was determined that based on the unique characteristics of the auto theft problem in Winnipeg, as well as the climate, bait cars were largely ineffective in Winnipeg and the program was discontinued. Another example is the ‘lets recreate Edmonton in Winnipeg’ experiment of the mid-1990’s that saw the proliferation of Service Centers, Community Offices, and Foot Patrol Offices under the guise of community policing, Edmonton style. At the height of the euphoria (some called it madness), the Winnipeg Police Service was attempting to staff as many as 22 public access locations at a cost of millions of dollars. These included 6 District Stations and 16 satellite offices. With the departure of the Chief (who was from Edmonton) most of those offices were quietly closed down. The Police Service now operates a total of 7 public access locations, 5 District Stations and 2 satellite offices. This is another example of a failed and very expensive experiment that can be attributed to the cookie cutter trap. Examples abound of failed attempts to superimpose apparently successful approaches and technologies from one jurisdiction to another. Establish the benefit or added value that the presence of a helicopter would have provided in the instances where it would have been deployed. Take vehicle pursuits as an example. Police collect data on vehicle pursuits which include the number of pursuits per year, broken down by month, week, day of the week and hour of day. There is also data about how long pursuits last. It would not be difficult or time-consuming to take the historical pursuit data, superimpose the anticipated helicopter flight times and specify with a reasonable degree of certainty the number of pursuits that a helicopter would have been available to deal with in 2008. Let’s say for the sake of argument that Winnipeg has 100 vehicular pursuits per year and that the average pursuit lasts about 4 minutes. This means that unless the helicopter is airborne it will arrive too late to be of use. Based on an optimistic projection of 1000 hours of flight time, that means the helicopter would be available to aid in perhaps a dozen vehicular pursuits annually. That’s one a month. And based on experience in dealing with auto thieves in Winnipeg, I’m not convinced that in those dozen cases the thieves will stop the stolen vehicle, get out and lie on the ground, and wait to be arrested as has been suggested, just because a helicopter is hovering overhead. This means that every time we have a pursuit in the city that ends badly and someone gets up on their soap box and says ‘it would have been different if we had a helicopter’ you need to take a big gulp of reality and say ‘it might have been different perhaps 12 percent of the time’. The other 88 percent of the time the helicopter would have been sitting on the ground. Anyone who suggests that the recent council decision on the helicopter issue was an example of evidence based decision-making either does not fully understand the concept or has allowed their personal bias on the issue to cloud their judgment. Anecdotes and rhetoric are not evidence. Winnipeg is a city with limited resources. Our tax dollars need to be spent wisely. Look at the spending of tax dollars like an investment. Do we want our tax dollars invested with a money manager who does not do his homework, who does not do research, who simply looks at what other money managers are doing and attempts to mirror their investments and then crosses his fingers and hopes for the best? I suppose if you are not a Winnipeg resident and your municipal tax dollars are going to East St. Paul this may be less of an issue for you. For the citizens of Winnipeg, however, it is a real issue. Why are crime numbers on the rise in Winnipeg? As indicated in a previous post, when the auto theft numbers are excluded, crime in the other 8 categories monitored under the Crimestat process is seen to have risen by 11 per cent in 2009. What is Crimestat all about? Crimestat is both simple and complicated. Like community policing, if Crimestat is treated as an add-on to existing operations as opposed to a pervasive organizational- wide approach it is doomed to failure. If an organization is not willing to ingrain Crimestat into the organizational fabric as its premier management and accountability process, it will ultimately fail. Relentless follow-up and assessment (holding commanders accountable for performance and results). The Crimestat process has one primary goal: crime reduction. The added positive spin-off effects are transparency and accountability, both internally and publicly. The first step in the process is actually the easiest. The gathering and formatting of accurate and timely crime data and intelligence information, although time consuming and labour intensive, is not difficult. What can be difficult is interpreting the data and identifying trends quickly, and selecting and implementing the appropriate tactics to deal with the issues identified. Although difficult, it is not beyond the grasp of most qualified police commanders. The most important aspect of the program is follow-up and assessment. Under the Crimestat process police executives must be immersed in the process. This means they must be totally up to date on what is happening on the streets, they must be able to spot and identify trends, and have a good grasp as to tactics that will likely be successful as well as the resources required to implement specific plans. If the police executive is not fully invested in the process the accountability aspect of the process will be lacking and it will fail. A lack of understanding and appreciation of the process can be remedied; a lack of commitment to or belief in the process is more problematic. Is Crimestat in Winnipeg broken? If its goal is to reduce crime, and instead crime is increasing, there is reason for concern as to its current effectiveness. In July of 2009 the Winnipeg Police Service Crimestat site showed a year to date reduction of 18% for the crime categories tracked by Crimestat compared to the same period in 2008. That number has now slipped to 11%. As indicated in the original post the overall reduction in crime numbers is driven by a decrease in the number of actual and attempted auto thefts. When the auto theft numbers were removed from the equation, the July numbers showed an overall increase of 6% in the other crime categories being tracked. By year end that number has now doubled to 12%. The upward trend is still driven by an increase in the number of residential break-ins (+11% January to July, +20 % January to December) and non-commercial robberies (+38% January to July, +38% January to December). Those percentages don’t really drive home the reality which is: in 2009, 487 more people had their houses broken into. 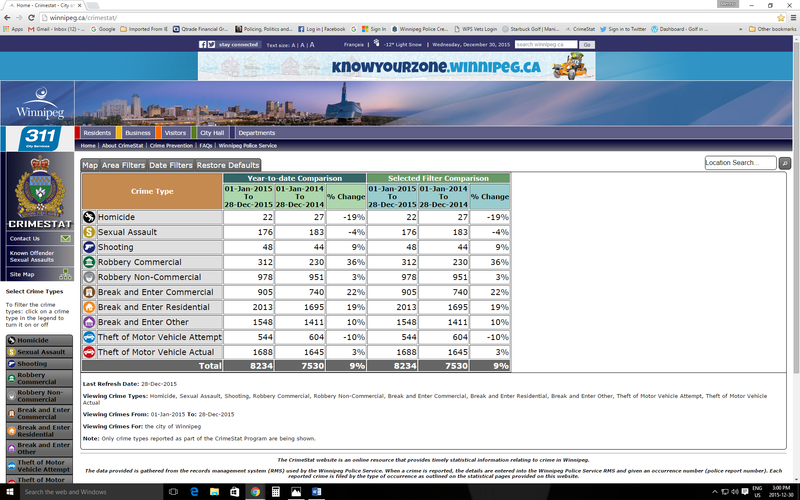 As well, 409 more people in Winnipeg were mugged in 2009 than in 2008. This leads to the inevitable question: why? Setting aside auto theft and attempts, why are crimes in 6 of the 8 other categories of crime tracked by Crimestat higher in 2009 than in 2008? Is Crimestat a flawed system? Is it an approach that works in other cities but not in Winnipeg? Are the tried and true principles first introduced by William Bratton and his team in New York City in the mid -1990’s no longer relevant? A subsequent post will review the 4 principles that form the basis of the Crimestat approach and attempt to answer these questions and, in particular, the question, Is Crimestat broken?